By Decision C(2010) 2576 of 29 April 2010, the Commission gave the Agency a mandate to develop and review the TSIs with a view to extending their scope to the whole rail system in the Union. Under the terms of that mandate, the Agency was requested to extend the scope of the TSI relating to the ‘operation and traffic management’ subsystem, to the whole rail system in the Union. Following the Commission’s report on the profile and tasks of other train crew members (3), the Commission asked the Agency to identify the common safety-critical tasks of other crew members not related to vehicle design/rolling stock and to define the scope of Appendix J to Annex I to Commission Decision 2012/757/EU (4) (TSI OPE). On 18 December 2013 and on 18 July 2014, the Agency issued two recommendations on the amendments to the TSI relating to the ‘operation and traffic management’ subsystem (ERA-REC-100-2013/REC and ERA-REC-101-2014/REC). Decision 2012/757/EU should therefore be amended accordingly. The operation and traffic management TSI established by this Regulation does not deal with all essential requirements. In accordance with Article 5(6) of Directive 2008/57/EC, technical aspects which are not covered by it should be identified as ‘open points’ governed by national rules applicable in each Member State. Implementation, and conformity with the relevant points, of the TSI set out in the Annex, should be determined in accordance with an implementation plan that each Member State is required to update for the lines for which it is responsible. Rail traffic currently operates under national, bilateral, multinational or international agreements. It is important that these do not hinder current and future progress towards interoperability. The Member States should therefore notify such agreements to the Commission. Directive 2008/57/EC defines the ‘operation and traffic management’ subsystem as functional. Consequently, the compliance with the TSI on operation and traffic management is not assessed when authorising a vehicle to be brought into service but should be assessed when assessing the safety management systems of railway undertakings and infrastructure managers. The technical specification for interoperability (TSI) relating to the “operation and traffic management” subsystem of the rail system in the entire European Union, as set out in Annex I, is hereby adopted. 1. The TSI set out in Annex I shall apply to the “operation and traffic management” subsystem of the rail system in the Union as defined in point 2.5 of Annex II to Directive 2008/57/EC. It excludes the cases referred to in Article 1(3) of Directive 2008/57/EC. 1. With regard to the issues classified as “open points” referred to in Appendix I of Annex I, the conditions to be complied with for verifying the interoperability pursuant to Article 17(3) of Directive 2008/57/EC shall be as set out in the national rules applicable in the Member State where the operation takes place. 2. By 1 January 2016 at the latest each Member State shall inform the other Member States and the Commission of its relevant national rules. 1. With regard to specific cases referred to in point 7.3 of Annex I, the conditions to be met for the verification of interoperability pursuant to Article 17(3) of Directive 2008/57/EC shall be as set out in the national rules applicable in the Member State where the operation takes place. Member States shall notify the Commission of the rules defining the type of rear end signal, as described in points 4.2.2.1.3.2 and 4.2.2.1.3.3 of Annex I, by 1 January 2016 at the latest, provided they have not already been notified under Decisions 2006/920/EC, 2008/231/EC, 2011/314/EU or this Decision. 1. The steps to be followed for the implementation of an interoperable operation and traffic management subsystem are set out in Section 7 of Annex I. 2. Member States shall prepare a national implementation plan, describing the actions they plan to take to comply with this Decision, in accordance with Section 7 of Annex I. Member States shall notify their national implementation plans to the Commission by 1 July 2017 at the latest. Member States shall also notify possible updates to these national implementation plans. 3. The Commission shall publish the national implementation plans, and any subsequent revisions notified, on its website and inform Member States about them through the Committee referred to in Directive 2008/57/EC. 4. Member States that have already sent their updated implementation plan shall not be required to send it again. (5) Commission Decision 2006/920/EC of 11 August 2006 concerning the technical specification of interoperability relating to the subsystem “Traffic Operation and Management” of the trans-European conventional rail system (OJ L 359, 18.12.2006, p. 1).’"
Annex I is replaced by the text in the Annex to this Regulation. It shall apply from 1 July 2015. Done at Brussels, 8 June 2015. (4) Commission Decision 2012/757/EU of 14 November 2012 concerning the technical specification for interoperability relating to the operation and traffic management subsystem of the rail system in the European Union and amending Decision 2007/756/EC (OJ L 345, 15.12.2012, p. 1). This Technical Specification for Interoperability (“TSI”) concerns the “operation and traffic management” subsystem shown in the list contained in point 1 of Annex II to Directive 2008/57/EC. Further information on this subsystem is provided in Chapter 2. Where necessary the TSI distinguishes between requirements for conventional and high-speed rail as defined in Annex I, Section 2.1 of Directive 2008/57/EC. “The procedures and related equipment enabling a coherent operation of the various structural subsystems, during both normal and degraded operation, including in particular train composition and train driving, traffic planning and management. This TSI applies to the “operation and traffic management” subsystem of infrastructure managers (hereinafter referred to as “IM”) and railway undertakings (hereinafter referred to as “RU”) related to the operation of trains on the European rail system as defined in Chapter 1.2. Points 4.6 and 4.7 apply to those staff undertaking the safety-critical tasks associated with accompanying a train. Point 4.6.2 applies to train drivers as provided for in point 8 of Annex VI to Directive 2007/59/EC. For those staff undertaking the safety-critical tasks associated with despatching trains and authorising train movements, mutual recognition of professional qualifications and health and safety conditions between Member States will apply. For those staff undertaking the safety-critical tasks associated with the last preparation of a train before it is scheduled to cross a border(s) and work beyond any location(s) designated as the “frontier” in the network statement of an infrastructure manager and included in his safety authorisation, point 4.6 shall apply while mutual recognition between Member States shall apply for point 4.7. A train will not be considered to be a cross-border service, if all the vehicles of the train crossing the state border cross it only to the “frontier” location(s). This TSI covers those elements (as set out in Chapter 4) of the rail “operation and traffic management” subsystem, where principally there are operational interfaces between RU and IM and where there is a particular benefit to interoperability. RU and IM must ensure that all requirements concerning rules and procedures as well as documentation are met by the establishment of the appropriate processes. The set up of these processes is a relevant part of RU’s and IM’s safety management system (hereinafter referred to as “SMS”) as required by Directive 2004/49/EC (1). The SMS itself is assessed by the relevant national safety authority (hereinafter referred to as “NSA”) before granting safety certificate/authorisation. The design criteria for these elements are described in the TSIs covering other subsystems such as rolling stock. In the context of this TSI it is their operational function that is considered. In accordance with Article 4(1) of Directive 2008/57/EC, the Union rail system, its subsystems and their interoperability constituents must meet the essential requirements set out in general terms in Annex III to that Directive. The following table summarises the correspondence between the essential requirements set out in Annex III to Directive 2008/57/EC and this TSI. Taking into account all the relevant essential requirements, the “operation and traffic management” subsystem, as described in point 2.2, covers only the elements specified in this Chapter. In accordance with Directive 2012/34/EU (2), it is the overall responsibility of the infrastructure manager to provide all the appropriate requirements which must be met by trains permitted to run on his network, taking into account the geographic particularities of individual lines and the functional or technical specifications set out in this Chapter. This point deals with staff who contribute to the operation of the subsystem by performing safety-critical tasks involving a direct interface between a railway undertaking and an infrastructure manager. health and safety conditions (see point 4.7). All the necessary procedures for the driver must be included in a document or a computer medium called the “Driver’s Rule Book”. The railway undertaking must present the Driver’s Rule Book in a clear format for the entire infrastructure over which their drivers will work. Predefined messages and forms must remain in the “operating” language of infrastructure manager(s). Drivers must be provided with a description of the lines and the associated line-side equipment for the lines over which they will operate and relevant to the driving task. Such information must be set out in a single document called the “Route Book” (which can either be a traditional document or computer-based). The railway undertaking is responsible for the complete and correct compilation of the Route Book, using the information supplied by the infrastructure manager(s). The infrastructure manager must provide the railway undertaking with at least the information for the Route Book as defined in Appendix D.
type of track to train radio equipment. means of communication with the traffic management/control centre in normal and degraded mode. The infrastructure manager must inform drivers of any changes to the line or relevant line-side equipment that have not been advised as modifications to information for the Route Book as set out in point 4.2.1.2.2.2. For staff on board trains, the structure, format, content and process for preparation and updating of such information must be based on the specification set out in Subsection 4.2.1.2. The language used for safety-related communication between train crew, other railway undertaking staff (as defined in Appendix G) and the staff authorising train movements is the operating language (as defined in Appendix J) used by the infrastructure manager on the route concerned. In accordance with Directive 2012/34/EU, the infrastructure manager is responsible for publishing the “operating” language used by his personnel in daily operational use. 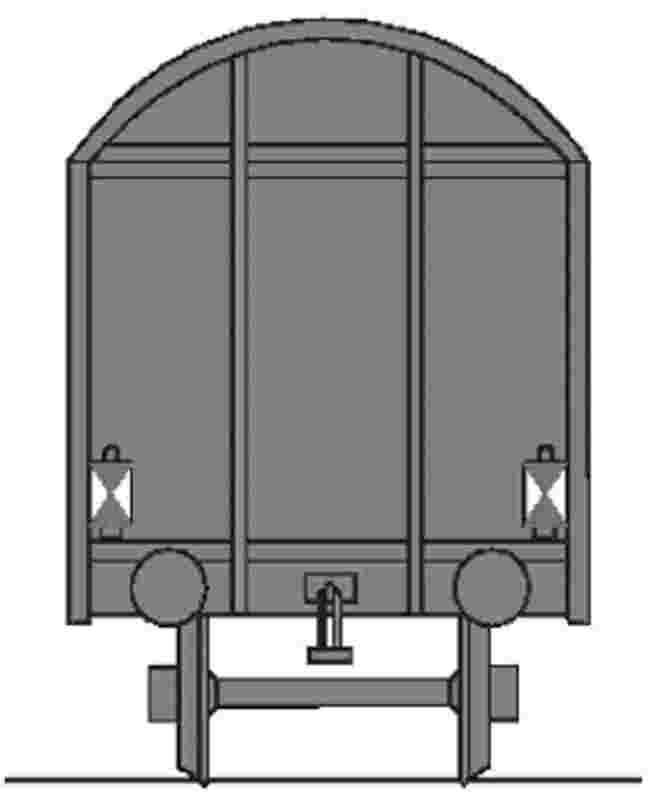 The forward facing front end of the leading vehicle of a train must be fitted with three lights in an isosceles triangle, as shown below. These lights must always be lit when the train is being driven from that end. The front-end lights must optimise train detectability (marker lights), provide sufficient visibility for the train driver (head lights) by night and during low light conditions and must not dazzle the drivers of oncoming trains. 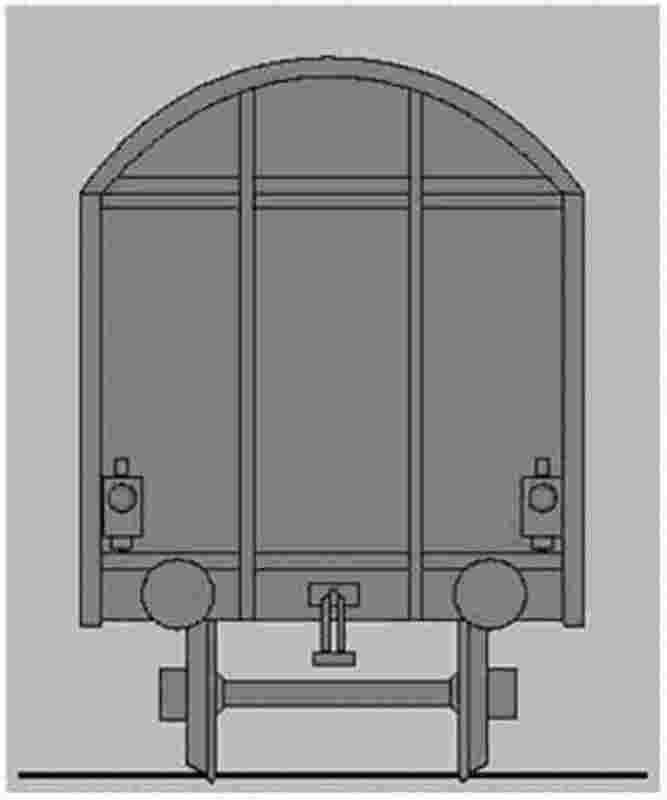 The spacing, the height above rails, the diameter, the intensity of the lights, the dimensions and shape of the emitted beam in both day and night time operation are defined in Commission Regulation (EU) No 1302/2014 (the “rolling stock — locomotives and passenger rolling stock” TSI (LOC&PAS TSI)) (3). The railway undertaking must provide the required means of indicating the rear of a train. The rear-end signal must only be exhibited on the rear of the last vehicle of the train. It must be displayed as shown below. The rear-end indication of a passenger train must consist of two steady red lights at the same height above buffer on the transversal axis. 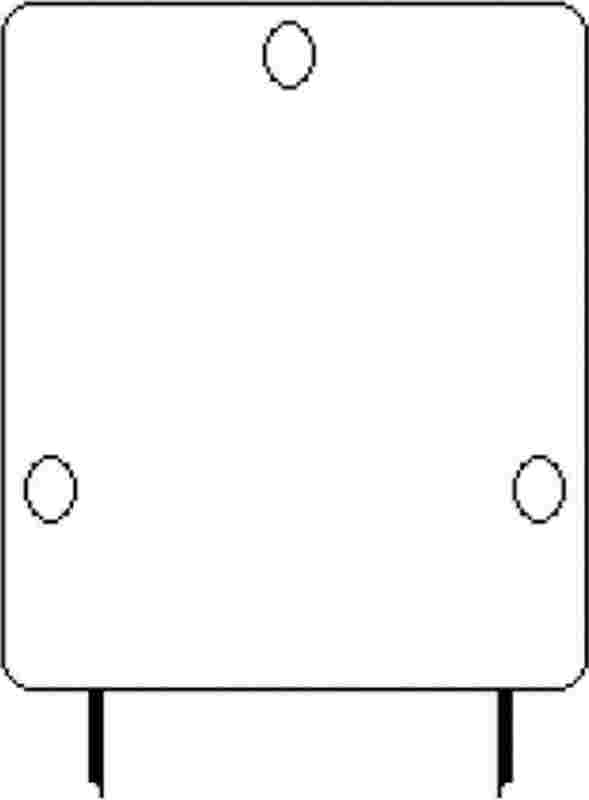 The lamps or plates must be on the same height above buffer on the transversal axis. Member States that require two reflective plates must also accept two steady red lights as train rear-end indication. there is no requirement that signallers must visually check the presence of a train rear-end device to verify that the train is complete. The Member State must notify the Commission which rules will apply on its network for trains not crossing a border. In addition, the notified rules for freight trains in international traffic described in 4.2.2.1.3.2 shall also be accepted for trains not crossing a border. Each vehicle must have a number to uniquely identify it from any other rail vehicle. This number must be prominently displayed at least on each longitudinal side of the vehicle. Further requirements are specified in Appendix H.
The infrastructure manager must inform the railway undertaking of the changes on characteristics of the allocated path change, as soon as these changes occur. The elements that must be checked in order to ensure the train’s compliance with the allocated path are set out in Appendix D.
All vehicles in a train must be connected to the continuous automatic braking system as defined in the RST TSI. conditions of use of braking systems possibly affecting the infrastructure such as magnetic, regenerative and eddy-current brake. for other trains (variable compositions of trains unable to run at a maximum speed higher than 200 km/h): brake weight percentage. If the infrastructure manager provides the abovementioned information, it shall be made available to all RUs who intend to operate trains on its network. The braking tables already in use and accepted for the existing lines at the date of entry into force of the present regulation shall also be made available. the rolling-stock-related margins derived from reliability and availability of the braking system. Furthermore, the railway undertaking shall ensure that during operation each train achieves at least the necessary braking performance. The railway undertaking shall set up and implement corresponding rules and shall manage them within its safety management system. In particular the railway undertaking has to set up rules to be used if a train does not reach the necessary braking performance during operation. In this case, the railway undertaking must immediately inform the infrastructure manager. The infrastructure manager may take appropriate measures to reduce the impact on the overall traffic on its network. The driver must be able to observe signals and line-side markers, and they must be observable by the driver whenever applicable. The same applies for other types of line-side signs if they are safety-related. where retro-reflectivity is employed, the reflective properties of the material used are in compliance with appropriate specifications and the signs are fabricated so that train headlights easily allow the driver to read the information. Driving cabs must be designed in such a consistent way that the driver is able to easily see the information displayed to him. A means of on-board monitoring of driver vigilance is necessary. This shall intervene to bring the train to a stand if the driver does not react within a certain time; the time range is specified in the rolling stock TSIs. In accordance with Directive 2012/34/EU the infrastructure manager must advise what data is required when a train path is requested. The train running number format is defined in Commission Decision 2012/88/EU (4), as amended (the control-command and signalling TSI (hereinafter referred to as “CCS TSI”). The infrastructure manager and the railway undertaking must have processes in place to monitor the efficient operation of all the services concerned. Data to be recorded for ETCS/GSM-R are those defined in the TSI CCS and that are relevant considering the requirements in point 4.2.3.5 of this TSI. The data must be securely sealed and stored and accessible to authorised bodies including National Investigation Bodies in carrying out their role pursuant to Article 19 of Directive 2004/49/EC. safety-related communication between the train driver and signaller. Further technical specifications concerning the recording device are set out in the TSI Loc & Pas. The rules and procedures enabling coherent operation of new and different structural subsystems intended to be used in the European Union rail system, and in particular those that are linked directly to the operation of a new control and signalling system, must be identical where identical situations exist. The operational principles and rules specific to the European Rail Traffic Management System (ERTMS/ETCS) and for ERTMS/GSM-R radio system are specified in Appendix A. Operational principles and rules, which are common across the European Union rail system, are specified in Appendix B. Staff of the railway undertaking and the infrastructure manager must have attained appropriate professional competence to undertake all necessary safety-critical tasks in normal, degraded and emergency situations. Such competence comprises professional knowledge and the ability to put this knowledge into practice. Minimum elements relevant to professional qualification for individual tasks can be found in Appendices F and G.
The infrastructure manager and the railway undertaking are required to ensure that their relevant staff are competent in the use of the communication protocols and principles set out in Appendix C.
Where the operating language used by the infrastructure manager differs from that habitually used by the railway undertaking’s staff, such linguistic and communications training must form a critical part of the railway undertaking’s overall competence management system. Railway undertaking staff whose duties require them to communicate with staff of the infrastructure manager in connection with safety-critical matters, whether in normal, degraded or emergency situations, must have a sufficient level of knowledge in the operating language of the infrastructure manager. The level of knowledge in the infrastructure manager’s operating language must be sufficient for safety purposes. complete the forms associated with the use of the Book of Forms. The level of knowledge for staff accompanying trains other than train drivers must be at least level 2 as described in Appendix E.
Railway undertakings and infrastructure managers are required to define the assessment process for their staff in order to meet the requirements specified in Commission Regulations (EU) 1158/2010 (6) and (EU) 1169/2010 (7). Railway undertakings and infrastructure managers must undertake an analysis of training needs for their relevant staff and define a process for reviewing and updating their individual training needs in order to meet the requirements specified in Regulations (EU) 1158/2010 and (EU) 1169/2010. For the tasks associated with “accompanying trains” and “preparing trains”, the elements that shall be considered can be found in respectively the appendices F and G. As appropriate, these elements must be put in place as part of the training for staff. It is possible that due to the type of operation envisaged by a railway undertaking or the nature of the network being run by an infrastructure manager, some of the elements in the appendices F and G will not be appropriate. The analysis of training needs must document those not deemed appropriate and the reasons why. The railway undertaking must make sure that the auxiliary staff (for example, catering and cleaning) not forming part of the train crew is, in addition to their basic instruction, trained to respond to the instructions of the fully trained members of the train crew. Medical examinations as specified in point 4.7.2 and any associated decisions on the individual fitness of staff must be conducted by a medical doctor. Staff must not perform safety-critical tasks whilst vigilance is impaired by substances such as alcohol, drugs or psychotropic medication. Therefore, the railway undertaking and the infrastructure manager must have in place procedures to control the risk that staff attend for work under the influence of such substances, or consume such substances at work. National rules of the Member State where a train service is operated apply with regard to defined limits of the abovementioned substances. screening for abuse of drugs. If any of those elements is omitted, the respective decision must be justified and documented by a psychologist. Applicants shall demonstrate their psychological fitness by passing an examination conducted by, or under the supervision of — to be decided by the Member State — a psychologist or a medical doctor. Increased frequency of examination must be set by the medical doctor if the state of health of the member of the staff requires so. screening for abuse of drugs where clinically indicated. Besides the periodic medical examination, an additional specific medical examination and/or psychological assessment must be performed where there is reasonable ground for doubting the medical or psychological fitness of a member of staff or reasonable suspicion of use of drugs or use of alcohol over the limits allowed. This would be the case especially after an incident or accident caused by human error on the part of the individual. lens implants, keratotomies and keratectomies are allowed only on condition that they are checked on a yearly basis or according to a frequency set by the medical doctor. the use of hearing aids is allowed. As defined in Article 2(f) of Directive 2008/57/EC, “interoperability constituents” means “any elementary component, group of components, subassembly or complete assembly of equipment incorporated or intended to be incorporated into a subsystem, upon which the interoperability of the rail system depends directly or indirectly. The concept of a ‘constituent’ covers both tangible objects and intangible objects such as software”. As this TSI does not yet specify any interoperability constituents, no assessment arrangements are discussed. In accordance with Articles 10 and 11 of Directive 2004/49/EC, railway undertakings and infrastructure managers must demonstrate compliance with the requirements of this TSI within their safety management system when applying for any new or amended safety certificate or safety authorisation. the relationship with implementation of the other subsystems (control-command and signalling, rolling stock, etc.). new or upgraded infrastructure, energy, rolling stock or command control and signalling subsystems, requiring a corresponding set of operating procedures, are put into service. It is commonly understood that the full implementation of all elements of this TSI cannot be complete until the hardware (infrastructure, control and command, etc.) that is to be operated has been harmonised. The guidelines set out in this Chapter must therefore only be seen as an interim phase supporting migration to the target system. in temporary cases Member States shall conform with the relevant subsystem either by 2030 (case “T1”, by 2024 (case “T2”) or by 2018 (case “T3”). For the implementation of point 4.2.2.1.3.2 and 4.2.2.1.3.3, trains which are operated solely on the 1 520 mm gauge network of Estonia, Latvia and Lithuania may use another specified train rear-end signal. For the implementation of point 4.2.3.2.1, Ireland and United Kingdom are using alphanumeric numbers in the existing systems. The MS set out the requirements and time schedule for the transition from alphanumeric train running numbers to numeric train running numbers in the target system. For the implementation of the common operational rule 5 of Appendix B, Finland may use another rule to mitigate the effect of a complete failure of train rear-end signal of passenger trains. For the implementation of point 4.2.2.1.3.3 and the implementation of common operational rule 5 of Appendix B, Finland is not using any rear-end signal device for freight trains. The means to indicate the train rear-end signal for freight trains as stated in point 4.2.2.1.3.2 are also accepted in Finland. The operating rules for ERTMS/ETCS and ERTMS/GSM-R are specified in the Technical Document “ETCS and GSM-R rules and principles — version 4” published on the ERA website (www.era.europa.eu). In case of degraded operation, the contingency arrangements set out in point 4.2.3.6.3 shall also be considered. when required to test the sanding equipment on the traction unit. when it is time to depart, except when allowed to start before the scheduled time. If the driver has not received an authorisation for train movement at the expected time, and has no information as to the reason, the driver shall inform the signaller. The driver shall inform the signaller about the failure. The train shall proceed at the maximum permitted speed to the nearest location where the front-end light can be repaired/replaced or the affected vehicle replaced. When proceeding, the driver shall use the train audible warning device as necessary or as instructed by the signaller. The driver shall inform the signaller about the failure. As long as a portable front-end light displaying a white light is fitted on the front of the train, the train shall proceed at the maximum allowable speed for that failure to the nearest location where the front-end light can be repaired/replaced or the affected vehicle replaced. If a portable front-end light is not available, the train shall not proceed, unless formal instructions are given by the signaller to continue to the nearest suitable location to where the line can be cleared. When proceeding, the driver shall use the train audible warning device as necessary or as instructed by the signaller. If the signaller becomes aware of the complete failure of the train rear-end signal, the signaller shall make arrangements to stop the train in an appropriate location and inform the driver. The driver shall then check the completeness of the train and if necessary repair/replace the train rear-end signal. The driver shall report to the signaller that the train is ready to proceed. Otherwise, if the repair is not possible, the train may not proceed, unless special arrangements are made between signaller and driver. If the audible warning device fails, the driver shall inform the signaller about the failure. The train shall not exceed the permitted speed for the failure of an audible warning device to the nearest location where the audible warning device can be repaired or the affected vehicle replaced. The driver shall be able to stop before passing over any level crossing where the audible warning device must be sounded and then proceed over the level crossing only when it is safe to do so. If a multi-tone audible warning device is defective but at least one tone is functioning, the train may proceed normally. When a technical failure affecting safety of running trains over a level crossing has been detected and as long as the safe operation has not been restored, the normal passing of trains over the level crossing must be prevented. Where the nature of the failure permits train movements to continue, the driver of each train shall be authorised to continue and to pass over the level crossing. After being instructed to pass over the level crossing with a failure, the driver shall pass the level crossing as instructed. If the level crossing becomes obstructed the driver shall take all possible measures necessary to stop. When approaching the level crossing, the driver shall use the audible warning device when necessary or when formal instructions have been given by the signaller. If the level crossing is clear, the driver shall proceed and accelerate the train as soon as the front of the train has passed clear the level crossing. In case of on board radio failure a train shall not be permitted to start a service on lines where a radio is required. to the nearest location where the radio can be repaired or the affected vehicle replaced as long as another means of communication is provided between the driver and the signaller. not exceed the maximum speed for running on sight. If a train is stopped by failure, the driver must immediately inform the signaller about the failure and the circumstances of the failure. the location of the failed train. the driver and signaller have agreed alternative arrangements. The signaller must not allow the assisting train to enter the section occupied by the failed train unless confirmation has been received that the failed train will not be moved. the brake performance of the train is checked, the automatic brake, if compatible, is connected and a brake test has been carried out. When the combined train is ready to continue, the driver in control must contact the signaller and inform the signaller of any restrictions and move the train in accordance with any instructions given by the signaller. The driver of the train concerned must have authorisation to pass a signal showing stop aspect/indication. When giving authorisation, the signaller must give the driver any instructions concerning the movement. The driver must apply the instructions and must not exceed any speed restriction, where one is imposed, until reaching the location where the normal operation can be resumed. the aspect of the signal is not clearly visible. The driver shall act according to the most restrictive aspect that could be presented by the signal. In all cases the driver must report to the signaller the abnormal signalling aspect when observed. When receiving an emergency call the driver shall assume that there is a dangerous situation and perform all actions necessary in order to avoid or reduce the effect of this situation. obey the instructions given by the signaller. Drivers that have been ordered to stop shall not restart without authorisation from the signaller. Other drivers shall continue running on sight until the signaller informs them that running on sight is no longer necessary. Any RU/IM staff who become aware of a danger to trains must take immediate action to stop any trains which may be affected and take any other action as necessary to avoid harm or loss. Any driver made aware of a danger to their train must stop and alert the signaller immediately to the danger. This Appendix sets out the rules for safety-related communications, between train crew, mainly the train driver, and signaller, in particular to define its structure and methodology. Safety-related communication has priority over all other communication. if necessary, let the person know how they can be contacted. Emergency messages are intended to give urgent operational instructions that are directly linked with the safety of the railway. For such messages the repetition of the message can be omitted. Drivers shall identify themselves by the train running number and the location. Signallers shall identify themselves by the control area or the location of the signal box. For communication between signallers and drivers it is the signallers’ responsibility to ensure that they are talking to the driver within their control area. This is critical when communication is taking place in areas where communications boundaries overlap. This principle shall apply even after an interruption during transmission. when quoting the identity of signals or points. A written order must only be issued when the train is at a standstill and shall be attributed with a unique identification or authorisation number provided by the signaller. A written order takes precedence over the related indications provided by trackside signals and/or the DMI except when a lower permitted speed or a lower release speed than the maximum speed prescribed in the written order is applicable. A written order should be issued as close as practicable to the affected area. A written order must only be issued when the driver has identified the train running number and the location of the train / shunting movement. unique identification or an authorisation number. other safe methods of communication to meet the abovementioned requirements. When the driver receives a written order the driver shall check that this written order refers to his train/shunting movement and its current location. A written order that has been issued can only be revoked by a new written order explicitly referring to the previous one. The infrastructure manager is responsible for drawing up the Book of Forms and the forms themselves in its operating language. All the forms to be used shall be assembled in a document or a computer medium called the Book of Forms. In order to identify the forms, a unique code word or number relating to the procedure shall be developed. This Book of Forms shall be used by both the driver and the staff authorising the movement of trains. The Book used by the driver and the Book used by the staff authorising the movement of trains shall be structured and numbered in the same way. the table containing the international phonetic alphabet. The second part contains the forms themselves. These must be collected by the RU and given to the driver. The railway undertaking shall produce a glossary of railway terminology for each network over which its trains operate. It shall supply the terms in regular use in the language chosen by the railway undertaking and in the “operating” language of the infrastructure manager(s) whose infrastructure the railway undertaking operates on. 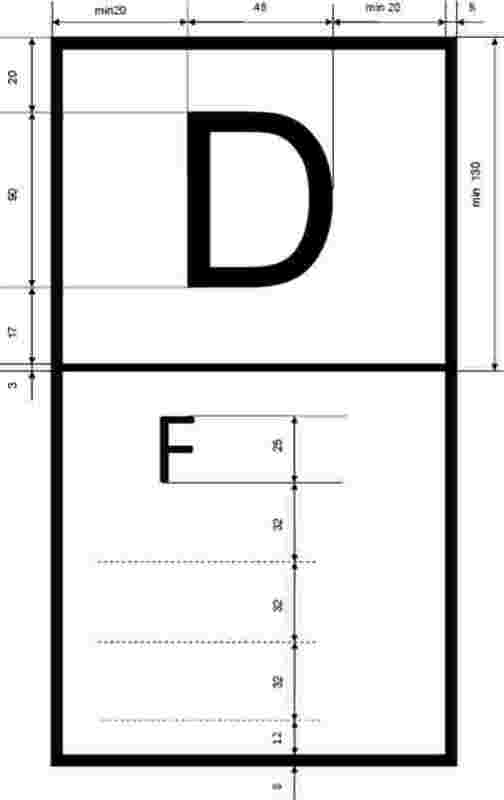 Information to be included on diagrams, supplemented as necessary by text. Where a separate station/yard/depot diagram is provided then information on line diagram may be simplified. Location of areas that must be passed with lowered pantographs. This Appendix, which must be read in conjunction with points 4.6 and 4.7 is a list of the elements that are deemed to be relevant to the tasks associated with accompanying a train on the network. The expression “professional qualification”, when taken within the context of this TSI, refers to those elements that are important to ensure that operational staff are trained and able to understand and discharge the tasks. Rules and procedures apply to the tasks being performed and to the person carrying out the tasks. These tasks may be carried out by any authorised qualified person irrespective of any name, job title or grade used in rules or procedures or by the individual company. Principles of organisation’s safety management system, relevant to the tasks. Roles and responsibilities of the key players involved in operations. General conditions relevant to the safety of passengers or cargo and persons on or about the railway track. Conditions of health and safety at work. General principles of security of the railway system. Personal safety including when leaving the train on the running line. Operational procedures and safety rules. Relevant aspects of control command and signalling system. Formalised messaging procedure including use of communication equipment. Appropriate knowledge of safety-critical tasks in respect to procedures and interfaces for rolling stock. Relevant operational arrangements (such as the method of train despatch) at individual locations (station equipment and signalling etc.). Stations at which passengers may alight or board the train. Local operating and emergency arrangements specific to the line(s) of route. communication methods in degraded operations/emergency situations. process for the use of line-side equipment and rolling stock, as well as any specific safety-related equipment. Checks before departure, including brake tests if necessary and correct closure of the doors. Assess the potential of a defect within the passenger areas and react according to rules and procedures. Protection and warning measures as required by the rules and regulations or in assistance to the driver. Communicate with the infrastructure manager’s staff when assisting the driver. The expression “professional qualification”, when taken within the context of this TSI, refers to those elements that are important to ensure that operational staff are trained and able to understand and discharge the elements of the task. Principles of organisation’s safety management system, relevant to the task. General conditions relevant to the safety of passengers and/or cargo including the carriage of dangerous goods and exceptional loads. Personal safety when on or in the vicinity of rail lines. Communications principles and formalised messaging procedure including use of communication equipment. Working of trains in normal, degraded and emergency situations. Operational procedures at individual locations (signalling, station/depot/yard equipment) and safety rules. Purpose and use of wagon and vehicle equipment. Identification of and arranging for technical inspections. Application of train composition rules, train braking rules, train loading rules etc. to ensure the train is in running order. Understanding of marking and labels on vehicles. Process for determining and making train data available. Communication with staff responsible for controlling the movement of trains. Degraded operations especially as it affects the preparation of trains. Protection and warning measures as required by the rules and regulations or local arrangements at the location in question. Actions to be taken in respect to incidents involving the carriage of dangerous goods (where relevant). The European Vehicle Number is assigned according to the codes defined in Commission Decision 2007/756/EC (8), Appendix 6. The keeper can add, in letters of larger size than the European Vehicle Number, an own number marking (consisting generally of digits of the serial number supplemented by alphabetical coding) useful in operations. The place where the own number is marked is left to the choice of the keeper, however it must be always be possible to distinguish easily the European Vehicle Number from the keeper’s own number marking. The marking of the country in which the vehicle is registered and of the technical characteristics are printed directly in front of, behind or under the twelve digits of the vehicle number. is provided with an authorisation valid in all Member States in accordance with Article 23(1) of Directive 2008/57/EC. Vehicles which are not authorised to be placed in service in all Member States in accordance with Article 23(1) of Directive 2008/57/EC need a marking indicating the Member States where the vehicle is authorised to be placed in service. 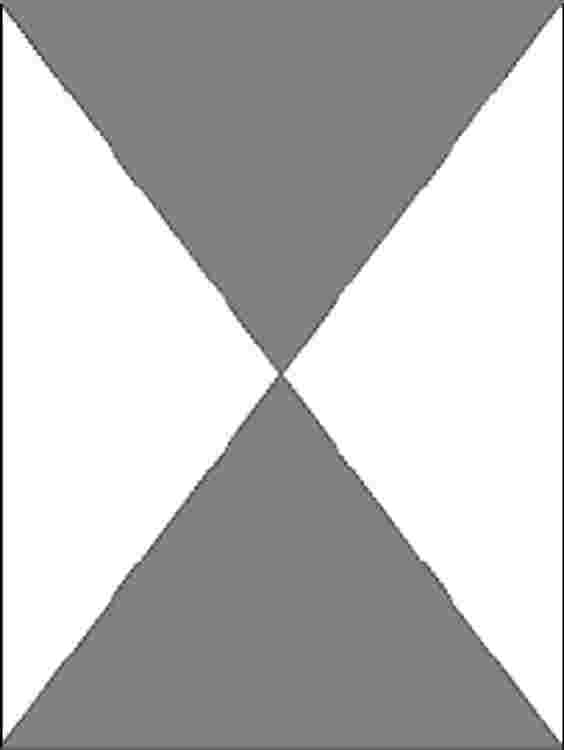 This marking shall be according to one of the following drawings, where D stands for the Member State who has granted the first authorisation (in the given example, Germany) and F stands for the second authorising MS (in the given example, France). The MS are codified in accordance with Decision 2007/756/EC, Appendix 6, part 4. Call set up in some dangerous situations to warn all trains/shunting movements in a defined area. Track, connected to the main track, used for passing, crossing and stabling. The language or languages used in daily operation an infrastructure manager and published in his Network Statement, for the communication of operational or safety- related messages between the staff of the infrastructure manager and the railway undertaking. A point on the train’s schedule where reporting of the arrival, departure or passing time is required. Task performed by staff when they control or affect the movement of a train, which could affect the health, and safety of persons. Planned stop for commercial or operational reasons. Any track(s) within an operational point which is used only for movement other than train movement. Performer in charge of the route setting of trains / shunting movements and of issuing instructions to drivers. Any signal aspect that does not allow the driver to pass the signal. Members of the on-board staff of a train, who are certified as competent and appointed by a railway undertaking to carry out specific, designated safety-related tasks on the train, for example the driver or the guard. Ensuring that a train is in a fit condition to enter service, that the train equipment is correctly deployed and that the formation of the train matches the train’s designated pathway. Train preparation also includes technical inspections carried out prior to the train entering service. (3) Commission Regulation (EU) No 1302/2014 of 18 November 2014 concerning a technical specification for interoperability relating to the “rolling stock — locomotives and passenger rolling stock” subsystem of the rail system in the European Union (OJ L 356, 12.12.2014, p. 228). (4) Commission Decision 2012/88/EU of 25 January 2012 on the technical specification for interoperability relating to the control-command and signalling subsystems of the trans-European rail system (OJ L 51, 23.2.2012, p. 1). (6) Commission Regulation (EU) No 1158/2010 of 9 December 2010 on a common safety method for assessing conformity with the requirements for obtaining railway safety certificates (OJ L 326, 10.12.2010, p. 11). (7) Commission Regulation (EU) No 1169/2010 of 10 December 2010 on a common safety method for assessing conformity with the requirements for obtaining a railway safety authorisation (OJ L 327, 11.12.2010, p. 13). (8) Commission Decision 2007/756/EC of 9 November 2007 adopting a common specification of the national vehicle register provided for under Articles 14(4) and (5) of Directives 96/48/EC and 2001/16/EC (OJ L 305, 23.11.2007, p. 30).